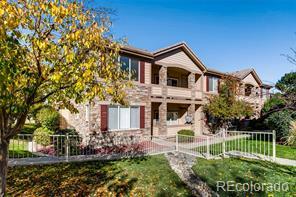 This updated, spacious, and bright condo at Moon Shadow is a must see! Newer laminate wood flooring, stainless appliances, and refinished cabinets provide a Pottery Barn vibe and a neutral backdrop for your furniture and style. Cozy gas fireplace and built-in shelves enhance the functionality and feel of the living space - true Colorado contemporary design! Moon Shadow offers great amenities and is conveniently located close to Saddle Rock Golf Course, Southlands Mall, and E-470.